Interactive PDF! 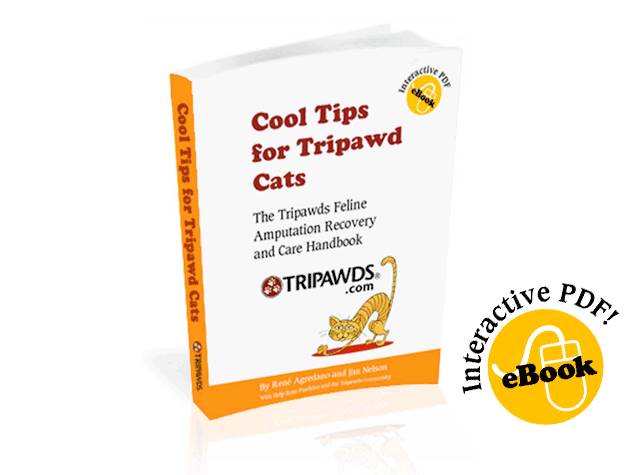 Download The Tripawds Feline Amputation Recovery and Care Handbook for fast answers to the most common concerns about cat limb amputation recovery and care. The information you’re about to read is a compilation of Tripawds member experiences, veterinarian interviews, and community discussions at Tripawds.com. You will learn the most important things to know about keeping your cat happy on three legs. This book contains hundreds of direct links to specific blog posts, forum topics, videos, podcasts and more. You can print the pages, but you’ll find the electronic version much more helpful. 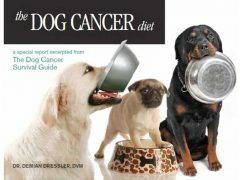 That’s because each link provides direct access to information presented at tripawds.com as well as other resources we’ve discovered. 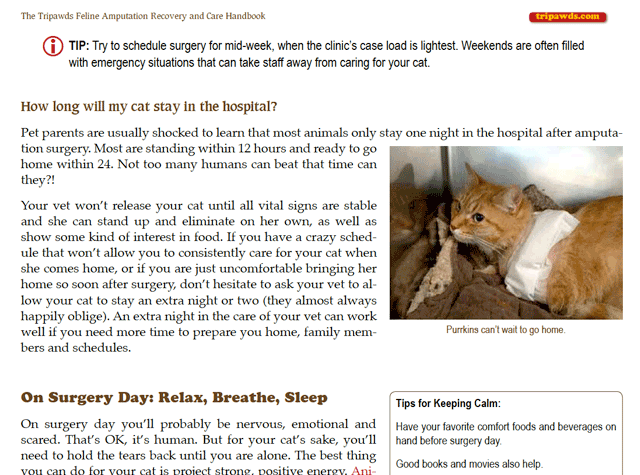 Download now for fast answers to the most common cat amputation recovery questions. 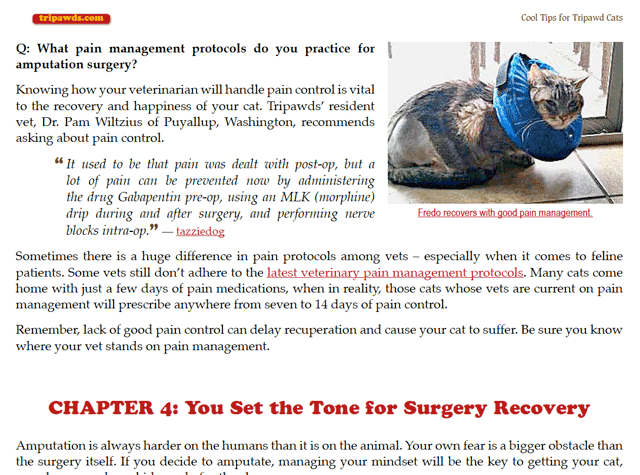 This 117-page interactive PDF features direct links to the best blog posts, forum topics, videos, and podcasts from more than ten years of the Tripawds Blogs and discussion forums. Absolutely pawsome!!! There is so much wonderful solid information in this book, it is amazing. It’s like my whole Tripawds experience wrapped in a neat package where you can gather information under one roof right away. Nothing will ever compare to the real life people that helped Huckleberry and my family in our time of need. I made friendships that i believe will be life long. 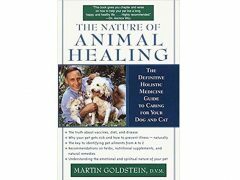 For any person just entering into this journey, those is an amazing amount of helpful insight that i believe will truly help prepare for success in helping their furbabies. Brilliant!!! Absolutely Brilliant! I have read through every page and will be going back to check out everypawdy’s links as well, i love that there are so many of our friends in the book!!!! Jim, Rene, Miss Holly and Whispering Purrrkins you have done a brilliant job on putting together a very comprehensive and fun book to read! I am able to relate some things to my old Spikey in regards to where his pain levels are at and i have further insight into all things Catssss! The whole book is super easy to navigate through and all of the informative links are just brilliant! I loved the back pages, for forms that can be printed and taken to your vets. We all know how intimidateing and frightening this whole process can be and we forget what we wanted to ask or point out. These forms make it super easy!!! Well done all of you!!! 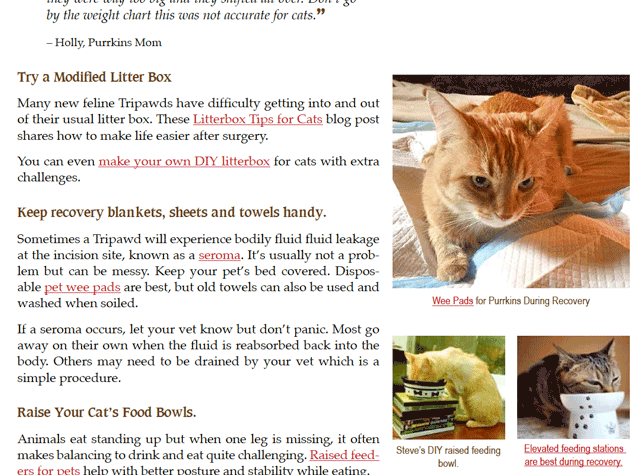 it is a brilliant reference and i will be sure to send people to it for a much needed resource for all things for Tripawd Catsss! 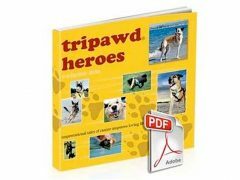 And thanks a gazillion times over to Tripawds.com!!! We all couldn’t do it without you!! !